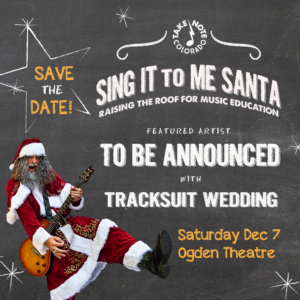 Since its founding in 2014 by Libby Anschutz and her band, Tracksuit Wedding, Sing It To Me Santa has become an annual Denver holiday tradition. Anchoring the line-up, each year Tracksuit Wedding brings its unique vintage rock/funk/blues sound of originals, covers and even a few holiday tunes to get the sold-out audience in the holiday spirit. Special musical guest appearances are always part of the fun and have included acclaimed artists such as: Todd Park Mohr of Big Head Todd & the Monsters; Bill Nershi of String Cheese Incident, and his wife Jilian; Isaac Slade of The Fray, and his wife, Anna; Kenny Passarelli, bassist/producer/songwriter; Neyla Pekarek, formerly of the Lumineers. Colorado’s talented government officials and music aficionados, Former Governor John Hickenlooper and First Lady of Denver Mary Louise Lee, have also been among our guest performers. While local country outlaw musician, Ryan Chrys (& the Rough Cuts), makes magic as our very own Santa. 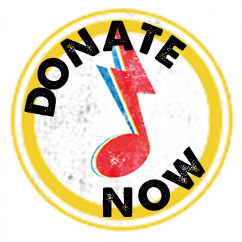 Staying true to Take Note Colorado’s mission, Colorado youth musicians are granted an opportunity to take the stage and are featured in the performance line-up. Emceed by Bret Saunders of 97.3 KBCO, Sing It To Me Santa is a celebration of Colorado’s cultural spirit. Past national headliners have included: The Fray, Michael Franti Trio and The Record Company. We guarantee that this year’s headliner will be equally sensational!